Friday night's storms blew the roof off some apartment houses in Bladensburg. The cooling process began Friday with a round of severe thunderstorms Friday afternoon and evening. Temperatures climbed into the 90s again Friday, but not the record-setting 99 we had at Reagan National Airport Thursday. A severe thunderstorm watch expired at 9 p.m., and several storm warnings were issued. In Bladensburg, Md., storms blew roofs off garden apartments at 54th and Newton streets, and a minor injury was reported. Possibly hundreds of residents could be displaced, according to Prince George's County Fire. Bladensburg High School was opened to provide shelter. There have been several reports of downed trees and fallen tree branches -- some blocking roads. At 18th Street and South Dakota Avenue in northeast D.C., a tree fell on a car, and one person was hospitalized with life-threatening injuries. In the 3900 block of South Dakota Avenue NE, a tree fell on a house. 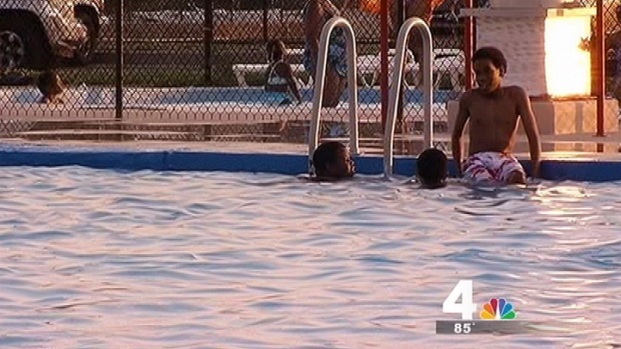 One person inside is believed to be OK.
More than 4,000 homes lost power (and A/C) Wednesday during a heat wave that has residents taking advantage of later city pool hours. At 16th and Lawrence streets in Northeast, a large tree on a house trapped one person inside. As of about 8:30 p.m., Pepco reported about 43,000 customers without power in D.C., Montgomery County and Prince George's County. And the storms caused flight delays at BWI. After the storms, temperatures should be more comfortable for the weekend and much of next week. Expect highs in the upper 80s Saturday and Sunday.